"We find the bars you'll tell your friends about." In addition to their website they also offer downloadable content. Now, back to the shameless self-promotion. 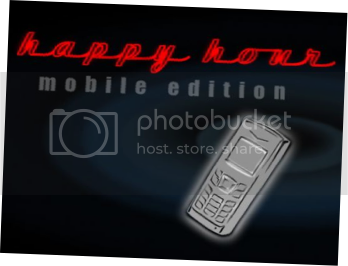 Mark, one of the creators of Happy Hour Mobile, interviewed me via e-mail regarding my journey through 1000 bars. I think he just wanted to see if I was still alive. Funny, now that I think about it, a lot of people seem to wonder about that. Well, once we established the fact that I was still ambling off to get my nose wet now and again he sent me a list of questions to answer regarding what I had learned along the way and what I was up to now. The results are now posted in the "Featured" section of their website. Check it out if you want to. I'll probably be having a pint or two with these guys in the near future and if I do you can be sure you will be reading about it here. The question that I have is On Saturday are they not open at all, or open 24 hours? I suspect they mean they are open from noon until midnight. People do not seem to realize that there is really no agreed upon definition of 12:00 A.M. and 12:00 P.M. Just to give you an example of the confusion surrounding this, dictionary.com says "If it is 12:00 a.m., then it is midnight. If it is 12:00 p.m., then it is noon." However, the U.S. Government Printing Office Style Manual says just the opposite. Kind of makes your head hurt. A.M. means before noon, from the Latin ante meridiem. P.M. means after noon, from the Latin post meridiem. Therefore you really can't have a 12:00 A.M., which would mean twelve o'clock before noon; that is nonsensical. And, of course, the same goes for 12:00 P.M.
Now I know that this has little to do with the main thrust of my blog, but given the number of bars that continue to use 12:00 A.M. and 12:00 P.M. when they advertise their hours and that this is a bit of a pet peeve of mine, I thought I would share. Of course anyone who advertises they are open from 12:00 P.M. to 12:00 P.M. really needs a proof-reader. 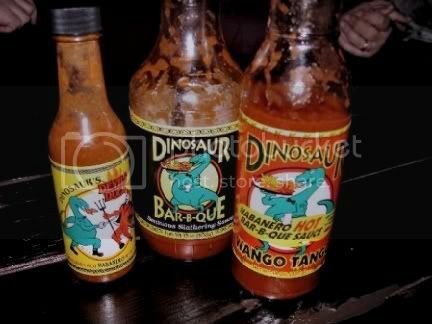 Yesterday I headed up to Harlem to visit the now legendary Dinosaur Barbecue. 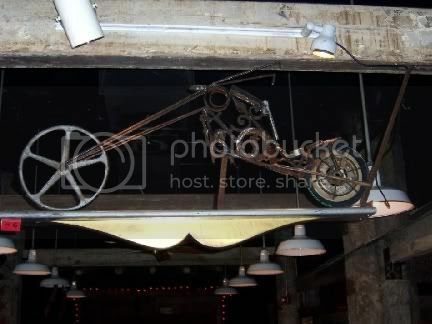 The original opened in Syracuse, New York and a second was opened in Rochester, New York. The one in Harlem is their most recent addition, opening in 2004. And a welcome addition it is. I don't have a car and this one is just a subway ride away from where I live in Downtown Brooklyn. Admittedly, it is a kind of long subway ride, but one well worth taking. It is on 131st Street in Manhattan and about as far West as you can go. If you take the 1 Train to 125th it is just a couple of blocks away. I don't know why it has taken me so long to visit here, but you can rest assured I will be back again. 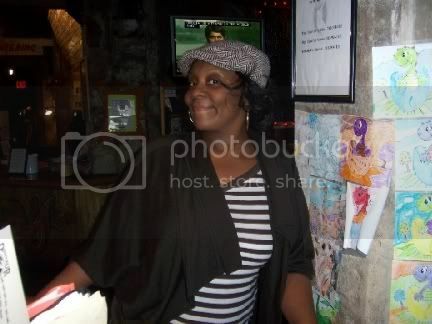 When we walked in we were greeted by the cheerful Sherry who guided us through the crowd to our table for four. 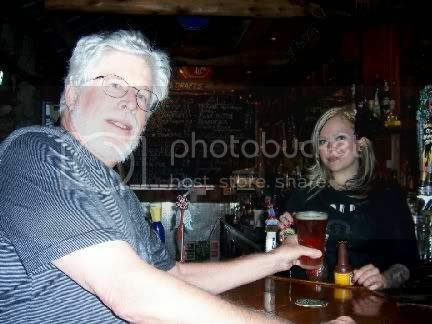 While the rest of the group perused the extensive menu of barbecued goodies, I headed to the bar for a beer. No surprise there, I guess. Ginger pulled me a draft Rogue Dead Guy Ale. 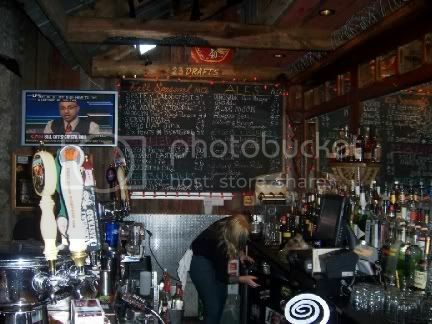 They had the type of cluttered bar you would expect in a place like this and quite an extensive beer menu. 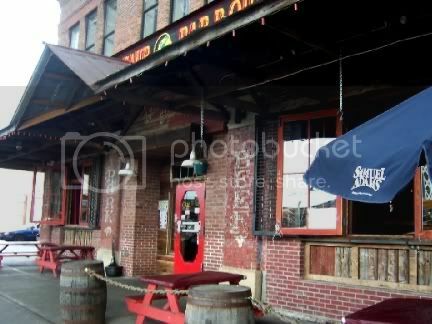 I think they have 25 different beers on draft and a pretty decent selection of bottled beers as well. 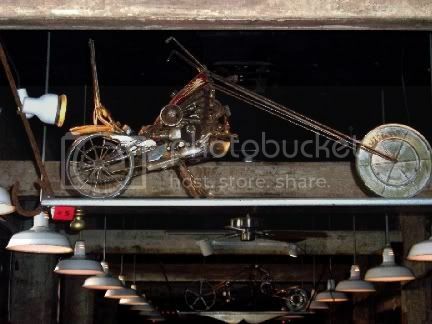 Dinosaur Barbecue has a bit of a biker theme so the decor features a lot of pigs and hogs. 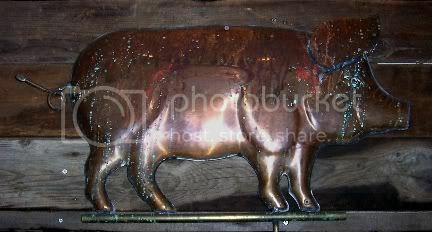 I am not sure if these chopper sculptures were for sale, but the artist does sell some of his works. I failed to take down his name and contact information though, so if someone knows it, send it to me and I will update this blog to include it. 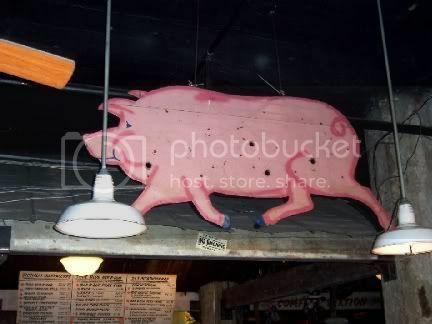 And, of course there were also the hogs you can eat decorating the walls. 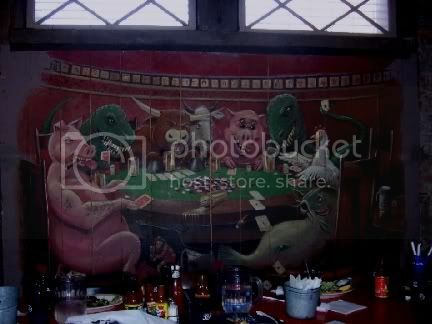 There was also had a neat variation on the dog's playing poker motif featured in a wall mural. Now no amount of decorations will help if the food isn't any good, but that certainly wasn't the case here. Not only was the food delicious, it was plentiful as well. 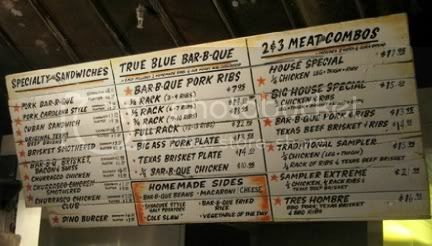 The menu on the wall was only a sample of what they had to offer, but it gives you a hint of what is available. We settled on an appetizer plate for four that included deviled eggs, fried green tomatoes, chicken wings, and boiled shrimp. A great way to start. We followed that with an order of ribs that came with corn bread and your choice of four side dishes. We settled for coleslaw, baked beans, greens, and I forget the last one. 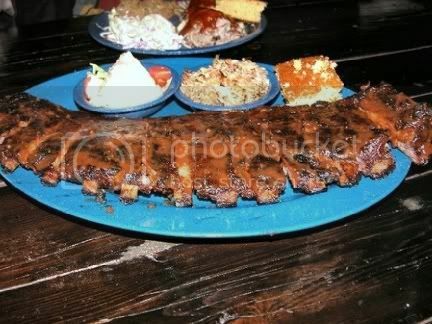 Do you think one order of ribs were enough for the four of us? Check it out. The had a number of sauces available if you thought the ribs needed more flavor. They really didn't, but it was fun to try them out anyway. 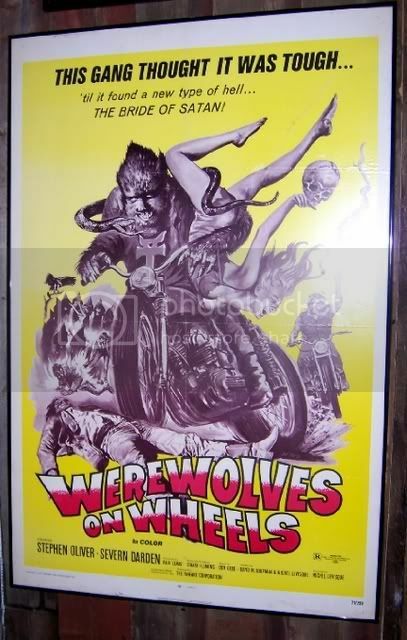 Old movie posters graced the walls and all I could think of was "Damn, they just don't make them like they used to." I will have to check NetFlix to see if they are available. I recommend that you try this place in mid-afternoon when it is merely crowded. I would imagine that during lunch and dinner hours it would be packed. Be sure to bring a hearty appetite. And, you might want to make your visit a high priority. It is located in an area that is being annexed by Columbia University, so how long it remains at this location is a bit of a question. Apparently Columbia University will help them relocate, but part of its allure is its current location amongst the auto repair shops.